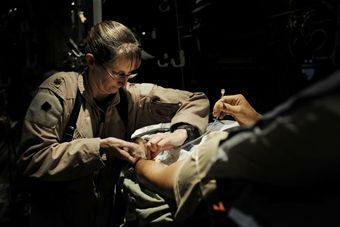 August 21, 2009, Kandahar Airfield, Afghanistan (AFNS) -- Flying hospital staff gives wounded fighting chance. At any given moment, a call can come in requiring an entire aeromedical evacuation staff here to stop what they are doing and begin preparing to care for the wounded and sick headed their way. The team of Airmen will pull supplies, alert additional crewmembers, get updates from aid stations and make decisions on what the patients will require while in flight. The 451st Expeditionary Aeromedical Evacuation Flight's charge is to create flying hospitals to transfer U.S. and coalition service members and civilians to a higher level of medical care. "Our mission is to maintain safe care and patient treatment on long aerial transport from one echelon of medical care to the next," said Capt. Aleacha Sanders, a 451st EAEF flight nurse. 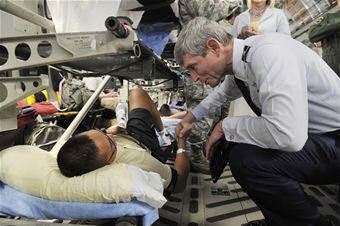 The aeromedical evacuation crews are three- and five-man teams staffed with a flight nurse and medical technicians. At least one crew is on alert at all times. Prior to being put on alert status, the team is given 12 hours of crew rest. Once those 12 hours are up, the team goes on alert for the next 48 hours. When a team is alerted, they load a vehicle with the necessary equipment for the flight and drive out to the aircraft, which could be anything from a C-130 Hercules to a C-17 Globemaster III to a KC-135 Stratotanker. While there is a standard set of equipment the aeromedical evacuation crew is required to bring, there are challenges to each mission that the team needs to overcome. "We need to make sure we calculate for power and O2 usage so that we can ensure we have enough supplies and how much oxygen a patient needs," said Master Sgt. Zac Johnson, a 451st EAEF flight medic. On the drive out to the aircraft, the aeromedical evacuation crew goes over the patients' records and comes up with a plan for in-flight treatment. "We formulate a game plan and determine what kind of flight conditions will affect the patients, what jobs we will each have and determine the best location for the patients to be placed," said Sergeant Johnson, a reservist from the 934th Aeromedical Evacuation Squadron in Minnesota. "As with the survivor of the helicopter crash who had an injury to the left eye, we tried to place him where it would not be too much effort for him to see. The patients need to be accessible in case of an emergency, but we also try to make them as comfortable as possible." Once the vehicle pulls up to the waiting aircraft, the aeromedical evacuation crew flies into motion, unloading supplies and equipment and creating set-up areas for the patients. "We set up a mini hospital in the belly of the aircraft," said Captain Sanders, who is deployed from the 43rd Aeromedical Evacuation Squadron at Pope Air Force Base, N.C. "It's important that we put ourselves in a mindset where we ask, 'What will I need if the patient takes a turn for the worse?'" When the ambulance pulls up to the aircraft, the aeromedical evacuation crew loads the patients. "If possible, the most critically injured patients should be at a working level with the less seriously wounded in higher and lower racks," said Maj. Missy Steckler, 451st EAES flight nurse. Once all the patients have been secured, the medical crew director or lead flight nurse will give the pilots the thumbs up for take off. When the aircraft has reached a safe altitude, the pilots signal the aeromedical evacuation crew it is safe to move around the cabin and begin monitoring and treating their patients. "Once we're given the approval to move around the cabin, we check on the patients, making sure they are tolerating the changes in altitude and ensuring their comfort," said Major Steckler, who is deployed from the 375th Aeromedical Evacuation Squadron at Scott AFB, Ill. "The safety of our patients and crew is paramount." Upon the aeromedical evacuation team's arrival at Bagram Airfield, Afghanistan, they are met with an ambulance and medics from the Craig Joint Theater Hospital. Sometimes, a patient's needs are such that they are treated at another echelon of medical care outside of the area of operations. During the return flight, the aeromedical evacuation crew often has time to close out paperwork and reflect on their accomplishments and experiences. "One of the most challenging parts of this job is seeing our wounded Soldiers right after they're hurt," said Senior Airman Libby See, a 451st EAEF flight medic. "I joined because I was sick of seeing it on TV and not being able to help. Sometimes, I can't do more than monitor their vitals and hold their hands. You remember everyone you care for though, and I hope that what I did was enough to get them home safe, alive."